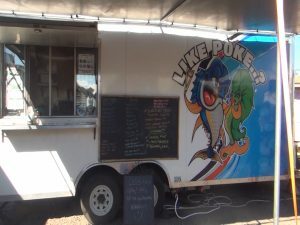 His food truck features a smiling dinosaur in a chef hat. 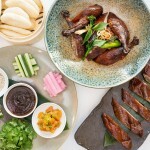 Dinos Zagouras, known as “Chef T. Rex,” has had a fiercely successful culinary career, working with notable chefs and top restaurants from New York City to France. 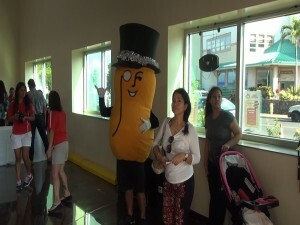 But with so much talent, there were endless demands. 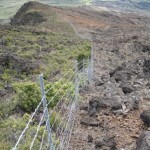 The work was grueling, and Maui was calling. 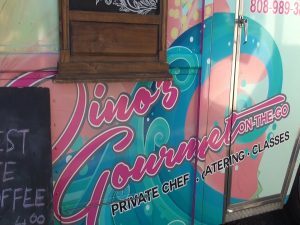 He bought a food truck out East and shipped it here, starting Dino’s Gourmet On-the-Go about a year and a half ago. Zagouras is originally from Greece, and says he connects with our island style. 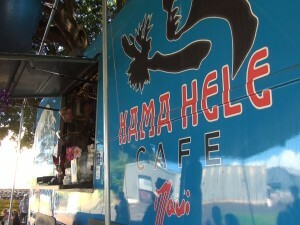 The food truck menu includes Maui Cattle Company beef pie, blue cheese burger, fresh-cut fries, fish of the day, crab cake, Swedish meatballs, and organic pasta. Zagouras also makes desserts, like chocolate panna cotta and lilikoi mousse. “I have 50 reviews on Yelp, all of them five stars, so that means I’m doing something good,” he smiles. 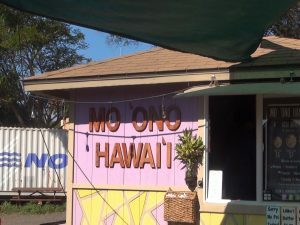 Dino’s just moved into the food truck community across from Costco in Kahului, which includes a range of food options, including poke, sushi, Mexican, Hawaiian and Thai food. 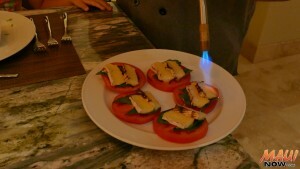 Zagouras calls his neighbors’ food “beautiful,” and brings a unique addition, describing his specialty as modern French cuisine. Dinos Zagouras, known as Chef T-Rex. 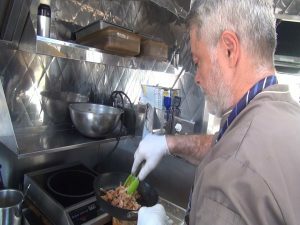 crafting an organic pasta dish in his food truck. Photo by Kiaora Bohlool. 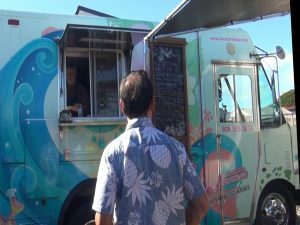 Customers at Dino’s food truck in Kahului. Photo by Kiaora Bohlool. 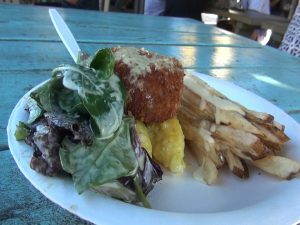 Dino’s crab cake with organic greens and fresh-cut fries. Photo by Kiaora Bohlool. 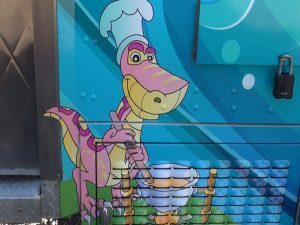 Dinosaur drawing on Dino’s food truck. Photo by Kiaora Bohlool. 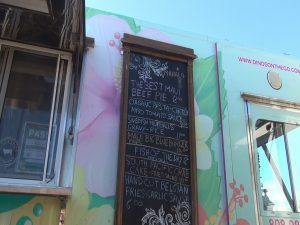 Dino’s food truck menu. Photo by Kiaora Bohlool. Dino’s Gourmet On-the-Go food truck. Photo by Kiaora Bohlool. 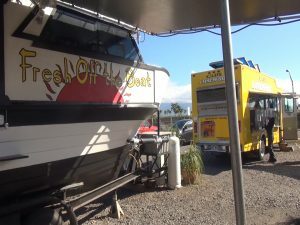 Other food trucks in the community across from Costco. Photo by Kiaora Bohlool. Zagouras takes pride in his creative freedom, and the responsibility that comes along with it. Although the hours can still be long, they’re his hours. 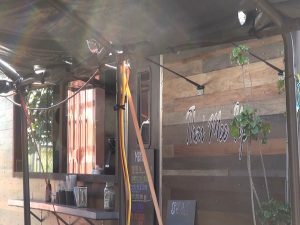 “Food is a passion, you give your heart, you’re going to work 48 hours sometimes like I do; this is your business,” he explains, adding that now, he’s not only a chef, but also a mechanic, electrician, cleaning crew, cashier and server as he builds his business. 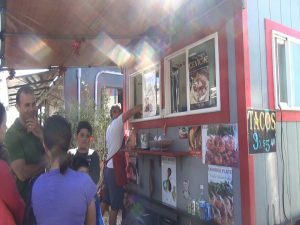 Dino’s Gourmet On-the-Go opens at 11 a.m. and stays open late on Wednesdays and Thursdays, until 8:30 p.m. You’ll also see the truck at the swap meet on Saturdays. With so many years of culinary excellence under his belt, Zagouras says the first focus for any chef should always be cleanliness.